Exports any scene with all its assets into a new folder as if it was a standalone library. 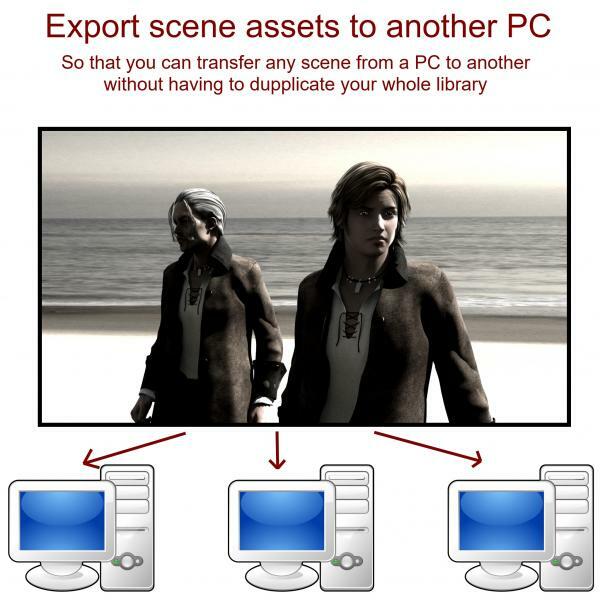 Allows you to share a scene between several PC without having to duplicate your whole lib. - Launch the "main" file and select a scene to export. Exports are located into "root_script_folder/extracted". - Copy exported scene on the PC you want. - Launch Daz from that PC. Add the scene's path as a source into your content library. You can now use your scene on that PC. MCphylyss (9 weeks ago) Inappropriate? adekii (9 weeks ago) Inappropriate? The steps seem straightforward enough, and it makes a folder structure based on what the scene would need, but the folders are always empty - this tool does not work. Users would still have to manually go through and copy out the files they need. MCphylyss (2 months ago) Inappropriate? cerealpirate (2 months ago) Inappropriate? Just so everyone knows this is a windows only app. need something for mac if anyone knows would really appreciate it. DonCamillo (3 months ago) Inappropriate? Thank you. It's a fantastic tool. xmasrose (9 months ago) Inappropriate? Sounds great! Something I really need! Mark Christian Holloway (10 months ago) Inappropriate? Greymom (10 months ago) Inappropriate? Oh, this is fantastic! Many thanks! hindudreams (11 months ago) Inappropriate? mikey186 (1 year ago) Inappropriate? BEST TOOL EVER! Hope to see more scripts in the near future. Maybe a way to pack DAZ content for distribution (for content creators)?